The number of adults who are overweight or obese and have type 2 diabetes is increasing rapidly throughout the United States. An estimated 35% of Americans are obese, and the number of U.S. diabetes cases has steadily risen to nearly 30 million. Alone, both obesity and diabetes can significantly increase healthcare costs, but these costs rise further when obesity and diabetes coexist. “It’s clear that strategies are needed to prevent obesity and diabetes, but it’s also important to improve how these conditions are managed when they develop,” says M. Sue Kirkman, MD. In recent years, clinical trials have been launched to test intensive lifestyle interventions (ILIs) aimed at promoting long-term weight loss and increasing physical activity. These interventions are recommended for overweight and obese individuals with type 2 diabetes. “ILI provides patients with education, support, and follow-up so that they can incorporate changes into their daily lives and overcome potential hurdles to healthy eating and exercise,” explains Dr. Kirkman. However, while it has been assumed that ILI can reduce healthcare costs, few studies have examined the long-term effects of these interventions on costs among obese patients with diabetes. The Action for Health in Diabetes (Look AHEAD) study is a randomized clinical trial that has sufficient size and duration to test whether ILI influences long-term healthcare use and costs. A recent study in Diabetes Care was conducted in more than 5,000 overweight or obese adults with type 2 diabetes who participated in the Look AHEAD study. Patients were randomly assigned to an ILI that promoted weight loss or to a comparison group of diabetes support and education (DSE). The research team recorded use and costs of healthcare services across an average of 10 years. 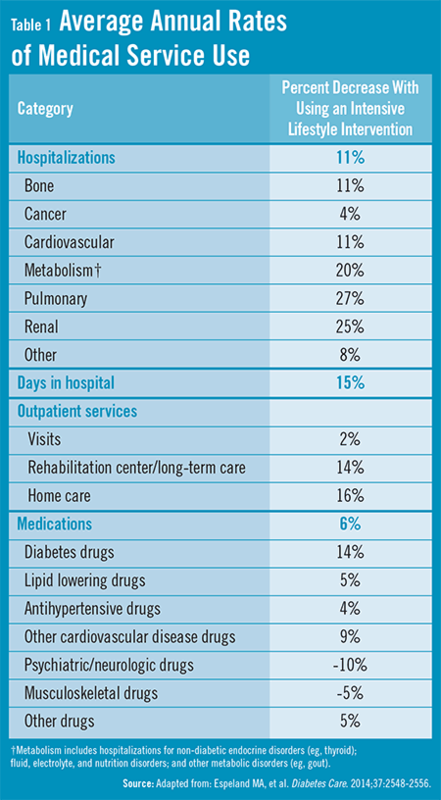 According to the results, ILI correlated with an 11% reduction in annual hospitalizations, a 15% reduction in hospital days, and a 6% decrease in number of medications used. 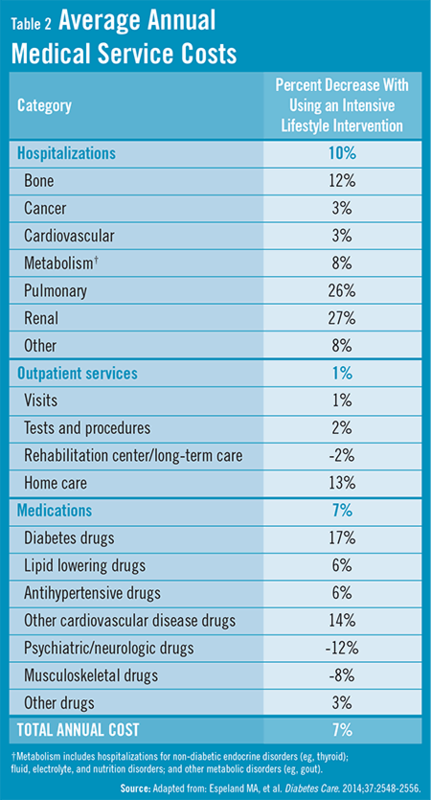 This resulted in annual cost savings of about 10% for hospitalizations and 7% for medications (Table 1 and Table 2). ILI produced an average relative per-person 10-year cost savings of $5,280, but researchers noted that these savings were not evident among patients with a history of cardiovascular disease (CVD). “Although the Look AHEAD study showed that ILI did not significantly reduce the overall risk of major CVD events, it did show that ILI improves many measures of health,” explains Dr. Kirkman. “These included markers of diabetes control, blood pressure, plasma lipid levels, sleep quality, physical function, and depression.” The effects of these factors varied in magnitude and duration, and some were not sustained throughout follow-up, but each could be associated with reduced healthcare needs. In previous research, healthcare costs associated with obesity and diabetes have been shown to accelerate in later life. In the Diabetes Care study, researchers noted that the increased outpatient costs among ILI participants with prior CVD were not triggered by an imbalance in CVD events. Annual outpatient costs were 22% higher among ILI recipients than among DSE participants before CVD events occurred. It is still unclear as to why ILI may affect costs differently among participants with and without a CVD history. Regardless, the study results imply that ILI is most beneficial to overweight and obese individuals with diabetes before CVD is diagnosed. Espeland MA, Glick HA, Bertoni A, et al; for the Look AHEAD Research Group. Impact of an intensive lifestyle intervention on use and cost of medical services among overweight and obese adults with type 2 diabetes: the Action for Health in Diabetes. Diabetes Care. 2014;37:2548-2556. Available at: http://care.diabetesjournals.org/content/37/9/2548.full. Wing RR, Bolin P, Brancati FL, et al; Look AHEAD Research Group. Cardiovascular effects of intensive lifestyle intervention in type 2 diabetes. N Engl J Med. 2013;369:145-154. Wing RR; Look AHEAD Research Group. Long-term effects of a lifestyle intervention on weight and cardiovascular risk factors in individuals with type 2 diabetes mellitus: four-year results of the Look AHEAD trial. Arch Intern Med. 2010;170:1566-1575. Rubin RR, Peyrot M, Gaussoin SA, et al; Look AHEAD Research Group. Four-year analysis of cardiovascular disease risk factors, depression symptoms, and antidepressant medicine use in the Look AHEAD (Action for Health in Diabetes) clinical trial of weight loss in diabetes. Diabetes Care. 2013;36:1088-1094. Gregg E, Chen H, Wagenknecht L, et al. ; Look AHEAD Research Group. Association of an intensive lifestyle intervention with remission of type 2 diabetes. JAMA. 2012;308:2489-2496.